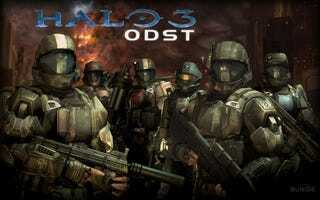 Halo: ODST returns players to the universe of Halo without its central character. Can Halo be fun without the Master Chief? While I haven't had a chance to play any of the campaign yet, ODST's new multiplayer mode, Firefight, was at E3 for some heavy play testing. What Is It? The enigmatically renamed Halo 3: Recon puts you in the shoes of a UNSC Orbital Drop Shock Trooper during the events leading up to Halo 3. The first-person shooter takes place in New Mombasa. At the beginning of the game the player gets separated from the rest team during a drop. I played several rounds of multiplayer Firefight, which has a team of gamers taking on increasingly difficult waves of enemies. Halo: ODST is due out Sept. 22, the matches I played seemed very polished. Horde Two: When we started our hands-on time with Firefight the Bungie folks were quick to tell us that this was not Horde mode. After playing it for a bit, I'm not sure why they're trying to make the distinction. If they do want to differentiate Firefight from Horde, they have a long way to go. If they don't, then they should embrace what is a solid game mode. Damage Control: This is no Master Chief you're controlling, which means you're shield free and once more dependent on health packs. Nothing changes the flavor of Halo more than having to start scrounging for health. Visor: You may not get Master Chief's height, shield or ability to dual-wield, but you do get a handy-dandy new night vision visor that you can toggle whenever you'd like. The visor also highlights enemies in a red outline, making it a bit easier to take on a wave of bad guys in the middle of a fire fight. Humanity: Everything from the perspective (remember you're no seven-footer) to the fact that falls will hurt you are reminders that you're just a grunt, not a super hero. It's nice, after years of playing the guy on the horse, to finally be the one down in the dirt having to get by. Team Play: It's kind of cool to be fighting shoulder-to-shoulder with four other grunts as you're taking on the full spectrum of Halo bad guys, including teams of Chieftans. New Weapons: The silenced submachine gun is a fun, but mostly ineffective weapon. Not so with the pistol, which returns to the Halo universe in all of its glory. Firing off headshots with this bad boy has never been easier. I loved Horde mode in Gears of War 2 and I love Firefight in Halo: ODST, both are fantastic multiplayer coop modes that force gamers to work together to survive. Adding skulls, achievements and leaderboards make it all the more fun.